Dr Angharad Eyre is an expert on religion in Victorian Britain, including its impact on women’s lives, education, and careers. In this blog post she describes the emotional life of Westfield College Principal Constance Maynard, and the unusual friendship network she maintained, via correspondence, among her former students. It provides an insight into the combination of intimacy, improvement and inspiration that made up Victorian friendships, and a comparison with other female friendship networks explored in ‘Five Hundred Years of Friendship‘. Like many of the first women’s college principals, Constance Maynard (Westfield College 1882-1913) found her work all too often unrewarding and lonely. She had refused an offer of marriage soon before starting as principal and she remained unmarried for life. As scholars have noted, her relationships with the women in her college were often fraught; she became involved in love triangles among the staff, and developed troubling relationships with students. In her diaries she often admitted to being deeply unhappy and this, combined with the stresses of managing a college, led to depression and at least two bouts of long-term illness. She countered these conditions with holidays, cycling, vegetarianism, and, most importantly, friendship. It was in letters to her alumnae, whom she saw and addressed as her ‘dear friends’, that she could admit to her feelings of despair and receive the comfort of their support. 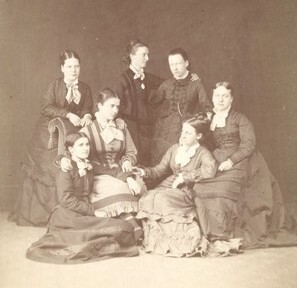 Maynard initiated a unique form of correspondence with her alumnae, which is most easily understood as a kind of chain letter. Maynard would write a letter to the first student on the list, who read it and sent it on with one of her own to the next person on the list, who then added hers, and so on. When the bundle came back to the original authors, they replaced their initial letters with new ones and continued to send the bundle round. In this way all were involved in a correspondence ‘ring’, receiving each other’s news along with the news of Westfield. This method was perfect for busy, professional women, wishing to maintain contact with each other but having no time to copy whole letters to numerous correspondents – as in traditional correspondence circles. The old letters were then sent back to Westfield for safe-keeping and were later disseminated to new generations of correspondents in separate ‘rings’, as more students graduated and became alumnae. By the time Constance Maynard retired there were eight rings of letters circulating. Unfortunately, the early secretaries of Westfield only preserved Constance Maynard’s side of the correspondence, and between 1887 and 1903 only two letters remain written by other authors. Conclusions as to the nature of the students’ letters can, however, be drawn from Maynard’s responses. Maynard implies here that she will belong equally with the alumnae. She also creates the expectation that it is not just she who needs to be kept informed of her alumnae’s work, but that it will be the desire of the entire college collective. Certainly, Maynard had her own reasons for hearing her alumnae’s news. Her ambition was for her college to create serious women, who would go on to work for social and moral reform. She hoped especially that they would become missionaries, or at least would carry on their social work in a religious manner. In early letters to each ring, Maynard’s friendship is that of an ex-principal, still informing her alumnae of their duty to the college. 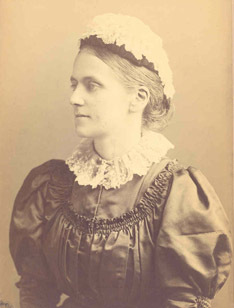 In the very first letter she demands: ‘What is the use of our College if it does not turn out “soldiers and servants” waiting and working and living first of all for this end?’ (letter, June 1887), and at times she scolded them for not writing enough about their work, saying: ‘You are altogether too diffident!’ (letter, January 1894). Maynard communicates a good deal in these two sentences. She legitimates her friend’s feelings of dejection, sympathising with her in their shared experience of the frustrations of ‘pioneer work’. She also suggests a respect for her friend’s bravery in continuing her work. Finally she attempts to cheer her friend with a jolly ‘cheer up!’, and communicates her own faith in eventual success to bolster that of her friend. In the late 1890s, when Maynard’s health and spirits were failing, her letters reveal that the correspondence rings, rather than being simply opportunities to influence her students, became more important to her for their emotional value. She wrote on a number of occasions that the letters were: ‘like a long row of your faces, and I am very glad indeed to think I can have a word with you every one’ (letter, June 1899). To some of the rings she felt able to admit to her depressive tendencies: ‘I confess I do sometimes get disappointed with the students in college, each generation as it comes. So very much is given them, and the spontaneous response seems so small’, and implies that, though she is temporarily cheered, she fears the ‘duller, damper feelings’ will come again (letter, January 1899). This was the nature of the friendship Maynard’s correspondence ring was to foster among women. Made possible by the new women’s colleges, it proved an invaluable support to the first generations of women college graduates. This entry was posted in Five Hundred Years of Friendship by Angharad Eyre. Bookmark the permalink.